I’m a sucker for Afternoon High Tea. Be it the classic English High Tea with the pretty three tier desserts, or a simple true-blue Singaporean tea break with Kaya toast and coffee – the fact is, all of us should enjoy our tea break. It is the period in between lunch and dinner, when we feel sleepy and grumpy. Food will never let you down, have a good feast! 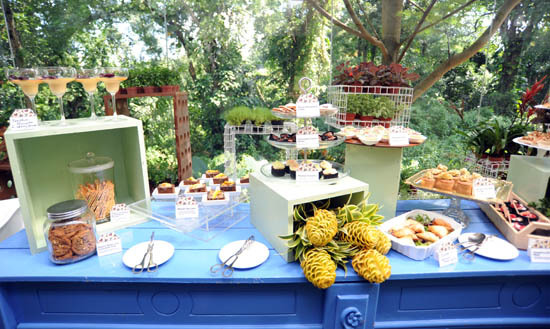 From 1st July till 1st October, Barracks Cafe at House, Dempsey road is serving what they called the “Summer High Tea Buffet” every Thursday and Friday afternoon from 3pm – 5.30pm. For $25 nett per pax, one gets to enjoy a leisure afternoon with your friends and loved ones over high tea items and a pot of tea. Now, don’t your Tuesday suddenly sounds much better already? In the name of research purposes, I went all out and tried to taste everything. Starting with the small and nimbly Cheesecake marbled brownie, I continued with the Chicken salad sandwich, tuna & shrimp sandwich, and munched a couple of the delicious cookies. The scones, oh the scones. There’s no need to find any excuses to eat butter and maple syrup, I can think of 1046 reasons to eat them. The scones from Barracks cafe were slightly dry and it would be better if they were heated up. But hey, you know what? Having scones during afternoon tea made it legitimate for me to indulge in butter and maple syrup without feeling guilty. In addition to the high tea offerings, we also ordered the Red Espresso Tea Set ($9.50). Note that it’s a separate order and not part of the high tea buffet. For a non-tea person, I enjoyed the red latte, but it was the Brioche with the red espresso jam that was truly amazing. Initially, I thought that the tiny bottle was a kaya spread. To my surprise, it was actually made from Rooibos tea. It looked like kaya, but it tasted even better than kaya! The Brioche, oh, it was so soft and super yummy. I know it sounds kind of bimbo-tic, but that’s the best description I can give. Forget about the summer high tea buffet all right? Go for the Red Espresso Tea set okay? I’d like to apologize for moaning out loud after I had the brioche. Oh my god. Oh my god. Unlike the more sophisticated offerings on Barracks Cafe’s ala carte dessert menu, the selections available at the high tea buffet, are simple and down-to-earth. There aren’t that many spectacular sweets, but for the kind of money and the variety offered, I think it’s a pretty good deal for high tea buffets. With a pot of tea, a nibble here or two, and in the company of your favorite person, the afternoon high tea at Barracks Cafe House Dempsey silently transits into dinner without anyone noticing. How naughty! We also had the skinny pizzas and a couple of their signature desserts. But that’s a story for another time. Check out my list of Singapore afternoon high tea places. Alternatively, if you are craving for some sweets, take a look at my recommendations of dessert places in Singapore. Note: This is an invited tasting session. weekday high tea buffet specials as value for money and appetizing as this, is the only reason i wish i’m a student again. you mentioned that the high tea buffet is served every thur and fri. so there isn’t any on any other day? my tuesdays would remain boring then. poisonivy: well you know you can always take leave to go for an afternoon tea high. daz: Hello the high tea buffet has mostly the food that you see in the picture. They change every now and then, but basically it has cakes, pastries, sandwiches, and mini desserts. after 1st October, does Barracks Cafe still have High Tea Buffet? Any high tea buffet in November ?